So where did photography start? Having seen an advert for the exhibition “Arrangements in Black and Grey” it seemed a good idea to visit the Fox Talbot Museum and learn some more about the work of William Henry Fox Talbot (1800-77) and follow up by visiting the exhibition, in effect putting it all into context in one venue, especially as the exhibition was of black and white photographs. Clearly we have come a long way since 1839 when Fox Talbot announced his process, particularly moving through the 1970s when conceptual photography came into its own and, perhaps, changed our whole thought process when looking at photographs – is it really as it was at that instant in time or has it been manipulated? What would Fox Talbot have made of this, after all his inspiration came from the desire to find a better way to record accurately the botanical specimens he was intent on including in his book, The Pencil of Nature (available as a free download EBook), having declared his drawing skills to fall well short of the mark. The Museum is well worth a visit. 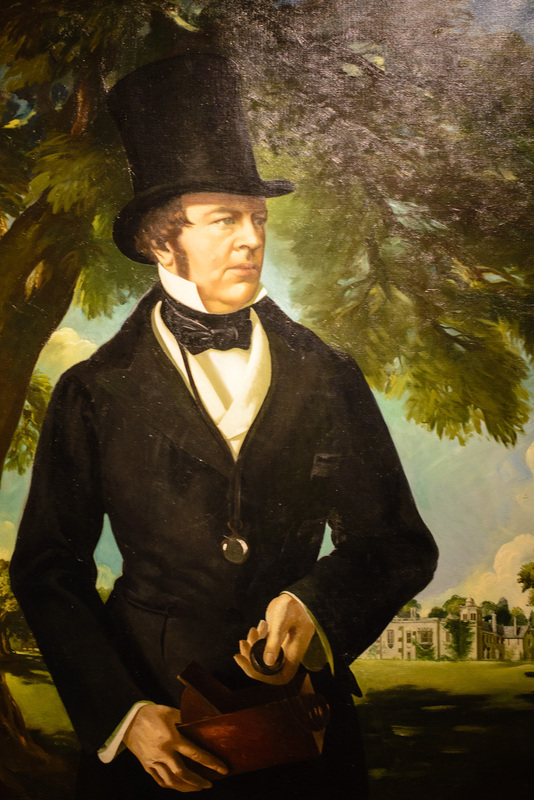 The display provides a real insight into the man Fox Talbot and what drove him to achieve all that he did. The displays of both the equipment he used and the results of his work bring to life this important piece of history. Somewhat ironically there was a connection for me with my earlier visit to Cardiff Diffusion and the exhibit “Wait and See” by f&d cartier in which early photographic paper was exposed in the exhibition room; standing in the museum somehow brought meaning for me that was not previously there. Moving on to the exhibition, Arrangements in Black and Grey. The work of six photographers was on display with considerable variety in both approach and subject matter. Deborah Parkin: Her theme was ‘Childhood’ and the pictures featured children, hers I believe, in various costumes and masks. Whilst I was taken by the composition of the shots and absence of colour in scenes where I would expect colour to be used to bring them to life, I found myself distracted by the subject matter which was not to my taste; as a consequence I did not spend much time viewing the images, rather just appreciating the use of black and white and the subtleties it introduces. Katie Cooke: This was a very impressive series of prints, all the shots being taken with a pinhole camera, stunning. The scenes were from a Morocco trip and, as such, I found it unusual to see the use of black and white when that part of the world is renowned for the vibrant colours in both its buildings and art work. However, these shots made a real impact on me and woke me up to just what the use of black and white can do for an image and what it conveys. The composition of the shots allowed the tones to depict the patterns, lines and textures of the architecture. And all of this with a pinhole camera! Mark Voce: Another set of prints that illustrated the power of black and white. I found myself drawn to two shots in particular, Molo San Marco and Rio Terra Foscanini, which held my attention for some time; the former was technically clever, in my humble opinion, with a line of gondolas out of focus in the middle foreground and everything else pin sharp ( I now know he used a tilt shift lens! ); the latter really conveyed atmosphere. Anthony Jones: These shots were striking in the use of hard lines in the majority which really emphasised the shapes and depicted the size of the buildings in the scene. However, again two shots were exceptional for me, the London cabs and the reflection in a puddle on a wet road. What I liked about the shot of the London cabs was the fact that he composed the image such that in the foreground, filling the majority of the frame was the back of the cab whilst in the background was the front of another; of course what calls out more for a black and white shot than the good old London hackney carriage! The image of the reflection in a puddle on a wet street is full of atmosphere and extremely powerful in its use of tones and captures the varying textures of the pavement and road surfaces. Nettie Edwards: I never really expected to find a section in this exhibition where all the images had been taken on an iPhone, quite a boost to morale as the header picture on my blog was taken on an iPhone! I particularly liked the composition of the shots of what appears to be a circular stairwell with the sweeping curves of the stairs and walls and the varying tones giving a certain harshness to the structure and the shadows created. These shots really showed what can be achieved with that multifunction device that many of us have become wedded to and gives some weight to the ongoing debate about where camera development is heading. Trevor Ashby: Not being one who much cares for stuffed wild animals I was at first put off this collection of photographs which was dominated by shots of such images; this perhaps says something about first impressions and, rather like buying a house, you have to look beyond the current owners taste in decor to really understand what is before you. In this case a second pass made a couple of the remaining images stand out, one of an egg held on the palm of an open gloved hand and the other of pea pods that had snail shells inserted in place of the peas then bound with either wire or fine twine. The shot of the egg really captured the fragility of the object and the black and white really made it pop. The pea pods shot was full of interesting shapes and textures and had a certain irony to it being the victim of these creatures in my vegetable plot. Overall I thought this was a very good exhibition and it really opened my eyes to the power of black and white photography. I think I am now convinced that the absence of colour does make you you look at the photograph in a different way and some scenes really lend themselves to this treatment. I do believe that there is a place for these images in 21st century photography, the question posed by the exhibition. One other thing that struck me regarding the presentation of the images was what a difference the frame and background makes. Some of the photographs really stood out and caught the eye, drawing you in, as a result of how they had been ‘framed’ and what background they had been set against, while others were quite the opposite. Of course I could not leave Lacock without going to find “the window”. Fox Talbot, H. (2010) Project Gutenberg Ebook the pencil of nature. (Ebook 33447). Project Gutenberg. Available from: http://www.gutenberg.org/files/33447/33447-pdf.pdf [Accessed 8 July 2013]. Freeman, M. (2011) The photographer’s vision. Lewes. The Ilex Press Ltd. This exhibition, at the Robert Phillips Gallery, Riverhouse Arts Centre, Walton-on-Thames, centred on the use of materials that would normally end up in landfill; the paintings and drawings are on old ceramic tiles and slate and the sculptures are fashioned from broken incandescent light bulbs. On entering the exhibition I was immediately struck by the urge to photograph the sculptures which were arranged on tables and, more striking, as ‘swarms’ hanging from frames suspended from the rafters. I saw this opportunity as a challenge as it was in a very bright, white environment lit by a multitude of spotlights, all at varying angles, something I had not tackled before. Also I had my camera with me “just in case” so was armed with just the trusty 50mm f/1.4 lens and everything was to be shot handheld. There was also the issue of shooting when there was clear line of sight as people moved around the exhibits. Having obtained permission to photograph I set about the task. These two shots seemed fairly straightforward as far as what I was trying to achieve, show the artist with examples of her work. However, the outcome illustrates the problem I was having with achieving consistency in the lighting conditions; my after action review points to the advantage of using Manual for consistency. These two shots illustrate the origins of the sculptures and the intricate detail of winding the filament wires to form the elements of the “bugs”, making each one unique. As far as the shots are concerned, again the lack of consistency in the whites of each shot is very evident albeit I did use the ‘expose to the right’ principle. Treating this as a still life photo in an ideal world would have involved use of a tripod and reflectors; this is an area for further practice. As I intimated at the start, the ‘swarms’ were very striking, forming 3D sculptures; obviously a great deal of effort went into the arrangement to create the effect. When photographing these I sought to use depth of field to best effect as well as capturing the light reflected off the nylon line used to suspend each ‘bug’ in the formation. When reviewing these shots after the event I was taken by the fact that each ‘bug’ had, in effect, a face formed by the solder contacts or clever use of the filaments; note to self, pay more attention to detail when viewing things lest you miss an opportunity. I really enjoyed this exhibition and was very much taken by the innovative use of “Trash” to produce some striking artworks and sculptures. It provided me with the opportunity to try shooting in an unfamiliar environment as well as capturing some unusual subjects. Clearly still life is a challenging subject area, particularly when it is attempted in a restricted environment. My thanks to Melanie for inviting me to her exhibition and then allowing me to “get in the way”. Paice, M. (2013) Trash to Treasure. Walton-on-Thames: The Robert Phillips Gallery. 15-26 May 2013.